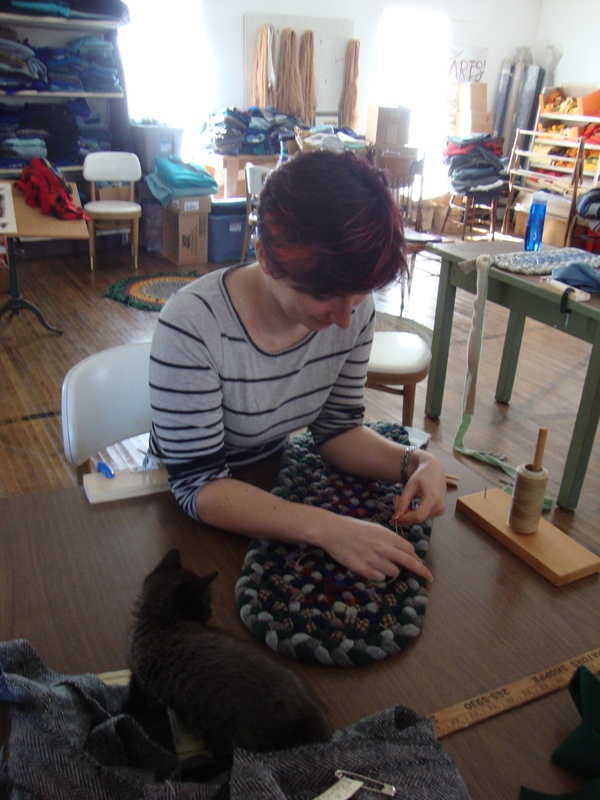 A few weeks ago, my daughter and I traveled to Parishville, New York to learn how to braid rugs. It was my daughter’s birthday and Mother’s Day weekend. Helen Condon, whom we’ve gotten to know from Great Camp Sagamore, has a thriving cottage industry in the old grange just by the dam over the St. Regis River there. 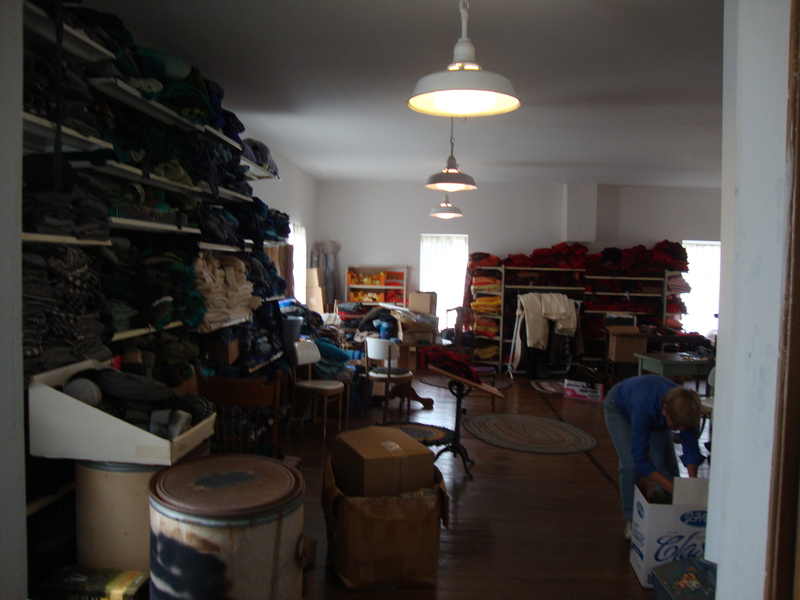 Her second floor is a vast workshop with shelving all around and heaving piles of wool in chromatically arranged colors. For a fee, she will feed and house two people at the grange over a weekend, provide a kit with the colors of your choice (and Helen’s theme) and teach you how to braid a rug or a basket or a chair seat. I chose a rug color scheme called “Blue Heron.” My daughter chose “October Forest.” During a weekend with Helen, you can form about eight rows of an oval rug and on Sunday, you bag up the remainder with all the accouterments, haul it home and finish it. It is now some weeks later and my daughter has finished her rug. I am now up to row fourteen of seventeen total rows for a 4 1/2 x 2 1/2 foot oval rug. A braided rug begins with a “navel,” the center connector of the three original 2-inch strands of wool in different colors or patterns. The strands are folded, imbedded and stitched in a T-formation. We attached the navel in a clip on a piece of plywood bound to the worktable by a C-clamp, and the braiding began. My mother used to braid my long hair when I was a child. It was a somewhat painful ordeal, especially for someone with my thick, easily tangled hair. But every day after breakfast until I was about eight or nine, I had my hair braided. If my mother was not around, one of my older sisters would do the duty. Straight part down the middle of my head, braids over either ear, barrettes to hold back the wisps on each side. Scrape, tug, pull, twist, pull, twist, pull, twist. There was a ferocity to the process which I endured and not quietly as I recall. However, I loved to braid and there was no one younger or willing to suffer my attentions. When I had measles (several times), I was forbidden to read (there was, and is, some medical evidence that measles could cause blindness in children, but as a result of a measles-concurrent Vitamin A deficiency, not, perhaps, from reading or eye strain, but this was the 1950s.) To entertain myself through the interminable days of illness, I would tear strips of tissue from a Kleenex and braid the strands, making little book marks for the books I would not be able to read until I was well. Helen would strip long yardage of wool for her rugs and tear them into 2-inch wide lengths to be used for braiding. Every time we’d get to the end of a strip, we’d add the same (or at a given point another strip) with a diagonal run through the sewing machine, then back to braiding. After about three feet of braid lay about us and around the fattening rug, we would stitch the braid to the last row of rug with a special thick, waxed thread and a broad flat needle. We’d break for wonderful meals with Helen and then back to work in the fields of wool. Helen had acquired a new kitten, named Della Reese, who sat either on my shoulder or on my daughter’s lap while we braided and stitched and turned. 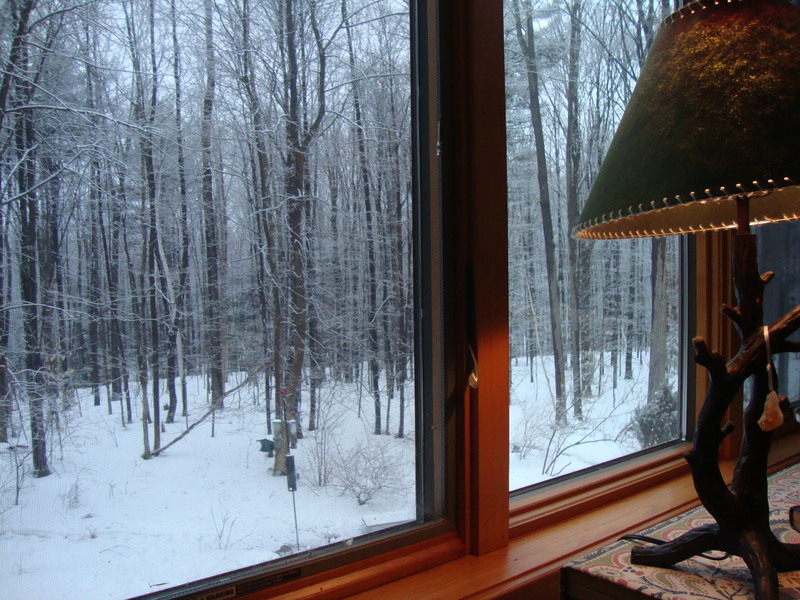 With the rushing sound of the St. Regis River outside the window, it was a lovely way to spend a weekend. 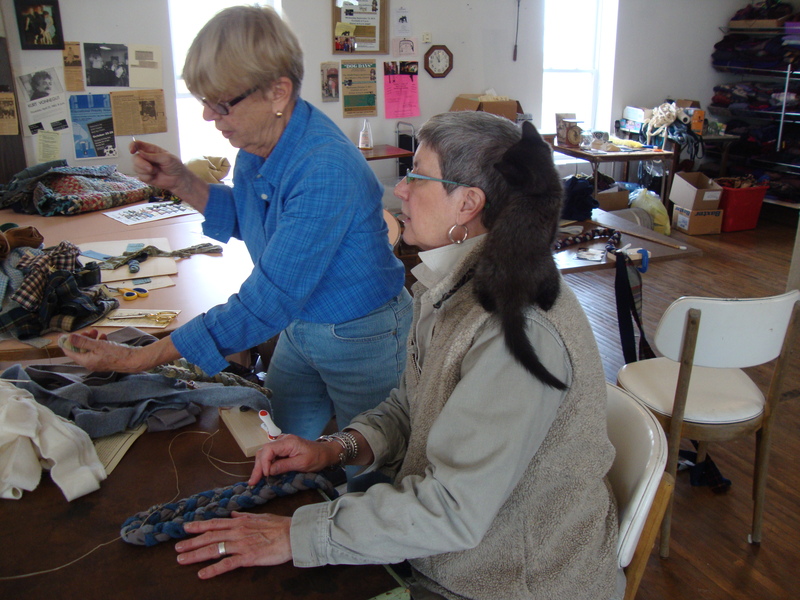 Genna braiding “October Forest” with Della watching. I’m not sure I will start my own cottage industry of Adirondack rug-braiding, but it has been interesting to learn a new skill set, one passed down from Helen’s grandmother to Helen and now to my daughter and me. At home, my own cat, Wink, sits on the rug while I work. “Blue Heron,” Helen’s Adirondack canvas the colors of pond, stilted regal bird, moss and reed greens and blue sky, is growing row by row in my imagination – perhaps a poem. 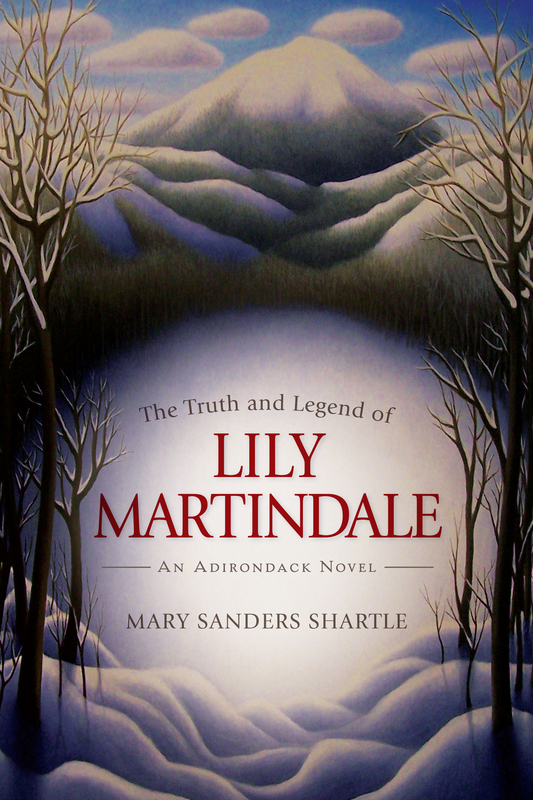 I look out at the waning Adirondack spring and imagine a canvas of my own with all the shades of green we see driving through the hills, the colors of lilac, honeysuckle and forsythia by the farm houses, the blue of sky. I wonder how much of those colors I could capture, as Helen has, in a 4 1/2 x 2 1/2 oval rug. I might call it “Adirondack Spring.” But Helen will probably beat me to it. I made sure to keep my daughter’s hair short when she was much younger. She could grow it as long as she wanted when she could shampoo and care for it by herself. I spared her, at least, that childhood imposition of forceful braiding. She did have the vaccines for measles, mumps and rubella. I’m not sure if I or someone else taught her to braid, but how lovely to have the ability to take something so inherent in our shared lives to make an object as useful and enduring as a woolen rug. Assignment: Write about a photograph and what it means. 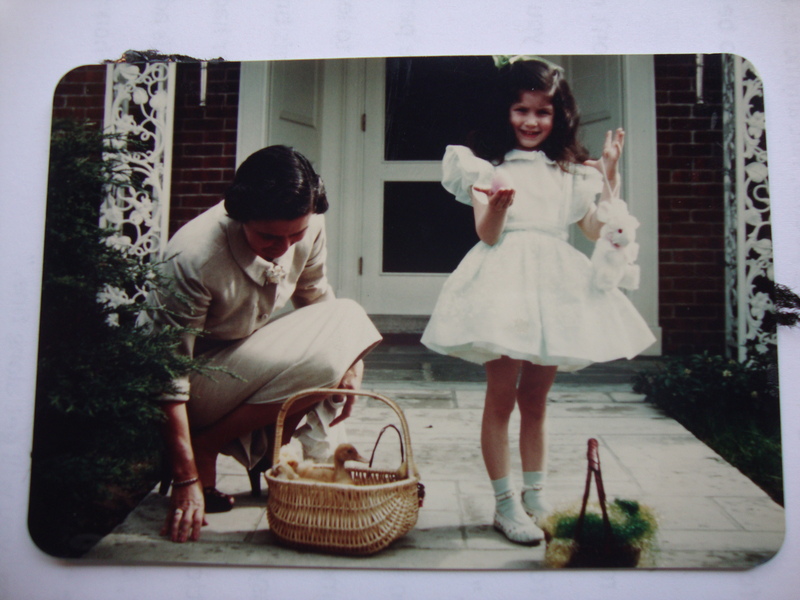 I’m remembering a picture of me as a little girl in a pinafore holding an Easter egg. Nearby, on our front stoop in Ohio, sits a basket with a real live duckling. My mother is nearby. The year is 1954. We are on our way to Easter Services at the First Presbyterian Church. My father, Buster Shartle, took the picture. It is warm enough in southwestern Ohio to be without a coat. 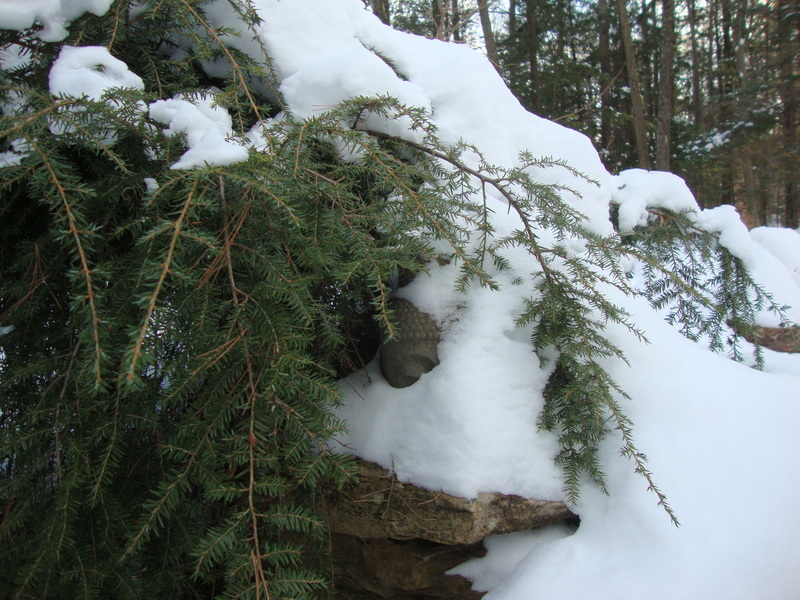 Here in the Adirondack foothills there is still a bit of snow left and I’m still dressing in layers. I am also remembering that little girl, so daintily dressed and pampered, lying in bed unable to sleep at night, trying to imagine what it must have felt like to have nails driven through flesh. Easter is, first of all, about the hideous death before there can be the Resurrection. It seems there was a lot for that little girl of four or five to absorb. The duckling was dispatched by a fox. The mother had issues. Easter ducklings and pinafores didn’t change things. These days in a world of hurt, it still hasn’t changed. A South Korean ferry filled with teenagers flipped over; we remembered the Boston Marathon bombings; another crazed high school kid went on rampage; another soldier, ditto. Perhaps that’s the reason that I have Buddha and Kuan Yin represented around my house and in my office rather than crucifixes. These are a witness to my life long struggle with all that’s been preached, promised and, in some cases, threatened from a Christian pulpit. Nietzsche said that the last true Christian died on the cross. John Shelby Spong said that God is unemployed, if not dead. He doesn’t save, He doesn’t heal, He no longer affects weather or battle outcomes. We seem to take care of or fail at most of that ourselves without His interference. So why church? Why Holy Week? On Saturday I helped the Altar Guild, one of the few of such active institutions left in this Episcopal Diocese of Albany. I polished brass. There is an 1880 collection plate fashioned by J&R Lamb Studios, famous still for its church windows, wood carvings and artifacts. The brass plate is engraved in the style of the pre-Raphaelite Brethren with passion flowers, oak leaf clusters, a cross and whip on the left side, and the three nails to the right of the central IHS symbol. The plate was donated by a woman named Abby Mumford Thompson in memory of her sister, Lucretia C. Whiting, about whom I can find little or no information. It is a thing of beauty, this plate meant for collecting money from the congregation and yet reminding the giver and receiver what is crucial to the faith–crucial–the same root for the word crucifix. Those engraved symbols seemed to be given more credence in those Victorian times. As I work on a chapter about such artifacts for a history of Bethesda Episcopal Church, I am aware not only of Bethesda’s history, but of all faiths and religions and their symbols. There were people back then who, when they cried “Heaven help us,” probably believed that there could still be Divine intervention in their crises. I honor the history while I struggle with the faith. I love the music, so beautifully performed by Farrell Goehring, Kathleen Slezak and the Bethesda Schola Cantorum. I love listening to scripture. I believe in showing up, helping, listening. I do not cry for Heaven’s help. I go to the doctor. I read John Shelby Spong. 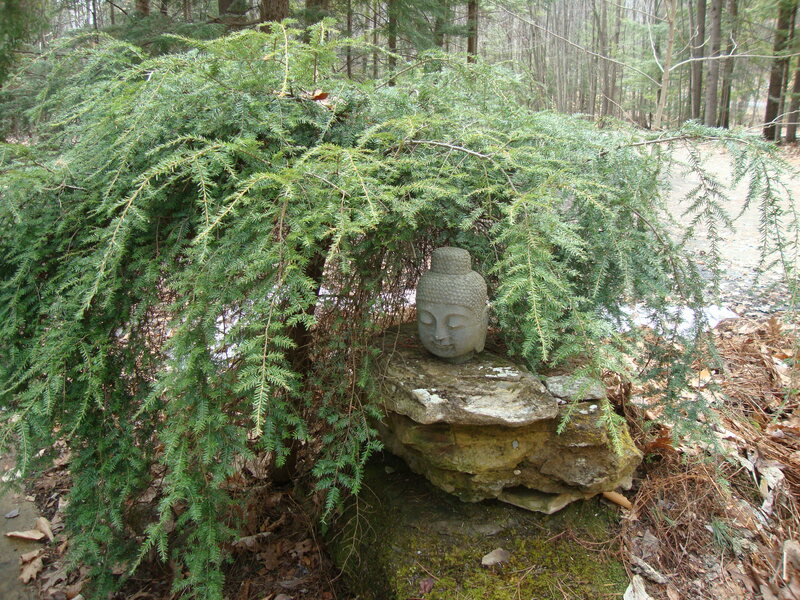 I wonder if the snow around the Buddha will ever melt. Check out the Readings page above for more dates and times across the region.